Naturopathic Doctors hold a doctorate in naturopathic medicine from one of six accredited naturopathic medical schools. This degree confers the title of Naturopathic Doctor and allows the holder of the degree to guarantee to the public that s/he possesses the requisite didactic and clinical training to practice Naturopathic Medicine. The doctorate degree prepares Naturopathic Doctors to be primary care general practitioners and to work together with other medical providers.Naturopathic Doctors are experts in the use of natural therapies and drug/nutrient, drug/herb interactions. For this reason Naturopathic doctors are increasingly being asked to serve in roles as experts in the field of Complementary and Alternative Medicine including: The White House Commission on CAM; as researchers and members of the advisory board for the National Institutes of Health (NIH) National Center for Complementary and Alternative Medicine (NCCAM); and the Medicare Coverage Advisory Committee.Naturopathic doctors use a variety of natural and non-invasive therapies, including clinical nutrition, herbal medicine, homeopathy, physical medicine, counseling and hydrotherapy. Many Naturopathic Doctors receive additional training in disciplines or modalities such as natural childbirth (midwifery), acupuncture and Oriental medicine, and Ayurvedic medicine.Naturopathic doctors are able to work in integrated settings with other medical providers. The result is a patient-centered approach that strives to provide the most appropriate treatment for an individual’s needs. Do Naturopathic Doctors Take Board Exams? Are They Licensed? Naturopathic Doctors take a national board exam, Naturopathic Physicians Licensing Exam (NPLEX), and attain a state license where it is available. The states that license Naturopathic Doctors or Naturopathic Physicians are Alaska, Arizona, California, Colorado, Connecticut, Hawaii, Kansas, Maine, Maryland, Montana, New Hampshire, Oregon, Utah, Vermont, Washington, and Washington DC. In licensed states NDs practice as independent primary care general practitioners, with the ability to diagnose and treat medical conditions, perform physical exams, ad order laboratory testing. In these states many health care consumers specifically choose NDs as their primary care providers. In states that do not license the profession, such as New York, Naturopathic Doctors are not able to offer all of the services they are trained to provide. Instead, they function as consultants without the ability to diagnose or prescribe. Naturopathic Doctors are trained at accredited, four-year, post-graduate, residential naturopathic medical programs. The training consists of comprehensive study of the conventional medical sciences, including anatomy, physiology, pathology, microbiology, immunology, clinical and physical diagnosis, laboratory diagnosis, cardiology, gastroenterology, gynecology, etc. The naturopathic education is unique in that naturopathic physicians complete extensive academic and clinical education in the use of natural medicines and that the training is based on the principles of naturopathic medicine. Naturopathic medicine has an independent accrediting agency, the Council on Naturopathic Medical Education (CNME), which is the recognized authority for establishing and maintaining the educational standards for the profession. 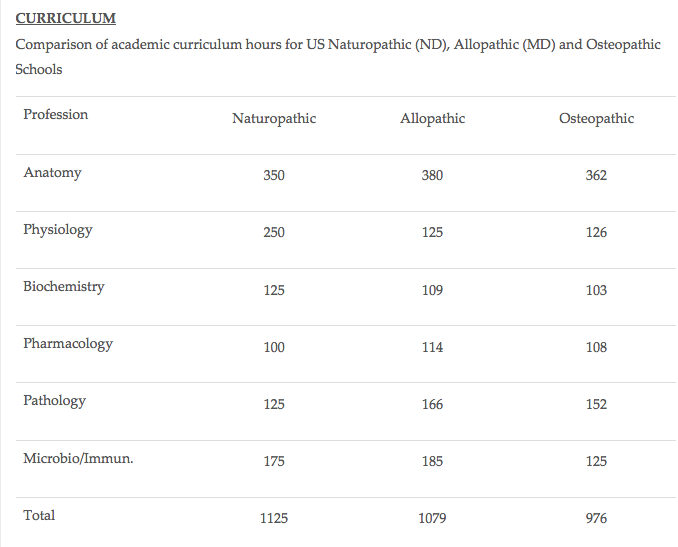 An example of the four-year curriculum of a naturopathic school (SCNM–Southwest College of Naturopathic Medicine and Health Sciences), can be found here.